It is not often that gutter systems around properties are given the attention that they deserve – but out Gorillas are hoping to change that. Every year, property owners in the Aldergrove area are contending with the consequences of clogged gutters. When upper perimeter drains become blocked, they open the door to invasive growth, pest infestation, fixture damage and rot. 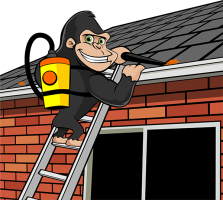 If you are having a hard time keeping up with your gutters, call in a Gorilla for your Aldergrove gutter cleaning service. A bit of TLC goes a long way for the sensitive areas of your home or commercial property. After a heavy rainfall or a shift in seasons, organic debris litters lawns with large items. Sticks, leaves and even smaller branches can be cleared away with the help of a rake but overhead these items are stuck. For the most part, roofs are sloped to encourage items to roll off surface and onto the ground. While the majority of items will tumble downward to the ground, some will become tangled up in your gutter system. While it is sometimes easy to see these items collecting from street level, smaller items pose the biggest issues. Small but dense items, such as seed pods, pinecones, or needles sink to the bottom of pipes, creating a foundation layer. This foundation layer traps lighter material and prevents it from traveling through your system. As water sits against construction materials of your property, it softens and wears away at protective layers and leaves sensitive areas exposed. This makes way for water damage, leaks, flooding and mould growth. Damp weather is commonplace in Metro Vancouver, so properties are designed with excessive moisture in mind. Even with all the forethought in the world, rain and snow melt become caught up in the pipes, sitting and making way for rot. Organic debris is known to hang onto moisture, and in a covered environment, like an eavestrough, can create a miniature ecosystem. What is a better environment for pest and small rodents than a damp and covered space? Leaving gutters to collect natural materials does not only have a negative impact on your property, but can invite infestations as well. High powered tools might provide powerful washing methods, but they do not account for the condition of your gutter system. Pointing a pressurized tool into pipes can lead to a lot of unnecessary damage. Basic practices like pressure washing just won’t get the job down at this level! Property owners might have their roofs cleaned regularly but a proper eavestrough cleaning is an art in itself. Instead of pushing debris from one area to another, pipes and gutter guards must be scrubbed along with downspouts to ensure the right results. At Gorilla Property Services, customer service and results are our top priorities. That is why our clients are kept in the loop through ‘before and after’ photos. There are plenty of gutter cleaning companies throughout the Metro Vancouver area but our Gorillas set themselves apart from the competition with technique and dedication. Instead of just scooping out leaves and debris, high-powered vacuums and sponges are used to remove every piece of dirt and debris. Once the entirety of your perimeter drains is treated, water is used to guarantee that gutters and downspouts are passable. 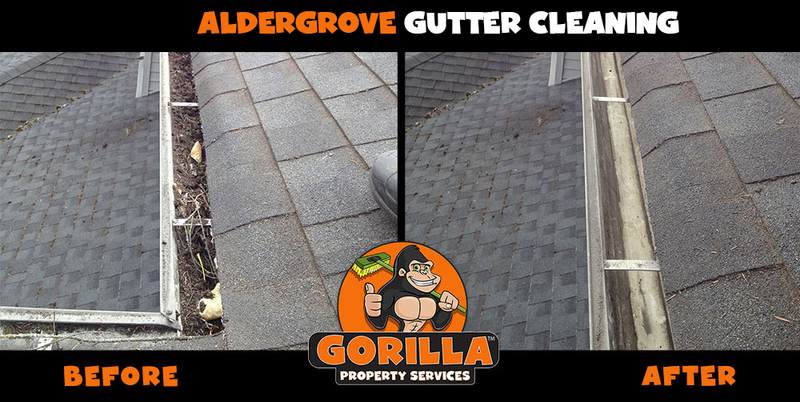 As B.C is known for its thriving natural landscape, our Gorillas highly recommend making your Aldergrove gutter cleaning a twice-annual practice.